Acer might have made budget-oriented workhorses in the past, but its new laptops are much classier affairs. None more so than the Aspire S5, a great-looking Ultrabook built from black brushed aluminium. It's also the first Ultrabook we've seen with a mechanical portbay that raises and lowers at the push of a button. When in the raised position, the svelte S5 is barely 15mm thick, although you're only able to use the multiformat card reader and 3.5mm audio jack inputs. Press the button above the keyboard tray and a whole extra set of ports appear from within. You get an HDMI video output, two USB3 ports and a Thunderbolt port – one of the first we've seen on a Windows-based laptop. It's a clever way to reduce the chassis size, although the awful grinding noise it makes when in motion doesn't exactly scream high-class. Plus, our review sample often remained stuck in the open position. chassis, but very springy actions that provide plenty of tactile feedback. All the QWERTY keys are full-size and sensibly spaced apart, but we were disappointed with the lack of a backlight which will make it difficult to keep working in low lighting conditions. Slightly less impressive was the all-in-one touchpad, which is a reasonable size but has little in the way of tactile feedback. The buttons are shallow, sometimes making it difficult to tell if your clicks have registered or not. Right clicks are relegated to the very corner of the touchpad, although multitouch gestures worked reasonably well and the touchpad itself was sensitive enough to make moving around the Windows desktop a breeze. The display is a definite low point. Compared to the similarly priced Samsung Series 9, which has a 1,600x900 display, the 1,366x768 resolution panel that Acer has used in the S5 is arguably sub-par for a high-end Ultrabook. There's a huge amount of screen tilt, but the TN panel technology suffers from disappointing viewing angles and the glossy finish makes it even harder to use underneath overhead lighting or in direct sunlight. The backlight was at least bright and even, producing vibrant images that were colourful and held up well when playing video, but it simply wasn't up to the standard we expect in a laptop costing over £1,000. boot into Windows in less than 20 seconds and resume from sleep in less than two. It also speeds up file transfers and application opening times, although it didn't make a huge difference to the results of our multimedia benchmarks. The larger SSD adds significantly to the price of the system, so if you have an external hard disk or store your multimedia files on a NAS, you could pick up a 128GB S5 for £849 and save £100 over the cost of the 256GB model. 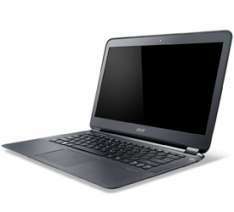 Unsurprisingly for an Ultrabook, the Intel processor also provides the graphics power. Although it's no powerhouse, scoring a jerky 15.8fps in our Dirt 3 test, the HD 4000 GPU core should still be able to play older games at lower resolutions and detail settings. It's also well suited to playing 1080p high-definition video on an external display, or 720p content on the laptop itself. On the plus side, the integrated GPU doesn't impact battery life in the same way a dedicated card might. However, the Aspire S5 didn't perform particularly well in our light-use test. Lasting a little under seven hours, it falls towards the bottom end of the current Ultrabook crop in terms of battery life. You'll still be able to work for most of the day without searching for a power outlet, but there are other similarly priced machines that have more capable batteries. Acer has dared to be different with the Aspire S5, and unfortunately the move hasn't paid off. Although its mechanical port bay makes it stand out against the competition, the horrible noise it makes is off-putting and feels a little cheap; not something you want from a £1,000 laptop. Performance and battery life are both distinctly average and the screen is disappointing compared to Ultrabooks from other manufacturers, such if you are spending upwards of £1,000 on an ultra-portable laptop, we suggest choosing the excellent Samsung Series 9 instead.